Who are they: Marshmallow Laser Feast is a creative studio that explores technology and creates work which reinterprets the idea of human perception. Their expertise has earned a reputation for making the seemingly impossible possible—from producing installations that push boundaries to redefining expectations and exciting audiences worldwide. Their work is responsive and spans kinetic sculpture, film, live performance and virtual reality. Yes, but WHO are they? : The MLF studio is a broad bunch of creatives, technologists and producers–you can read more about the team under their AltCity São Paulo profiles here. What’s their work like? : An eye-popping foray into the mind of MLF can take you just about anywhere. For example, go to the deepest darkest reaches of Cumbria’s Grisdale Forest, where you’ll experience the sensory perceptions of British woodland creatures via MLF's immersive experience, In the Eyes of the Animal–see reviews in WIRED, and New Scientist. Or be transported to a high-tech, colourful dystopia where virtual reality has utterly transformed the world in Stor Eiglass–an interactive music video made with Warp Records and Sqaurepusher, designed especially for a VR headset experience. What we’re cooking up: We’re working with the MLF team and colleagues in Brazil on a new artists residency programme in partnership with the SESI-SP art gallery in São Paulo. MLF will be working with local artists and communities to explore the exponential possibilities of using technology in creative ways. The residency and collaboration will create a show-stopping new piece of work for SESI’s landmark building. The MLF team say, "We're really excited to work with a group of artists in São Paolo. 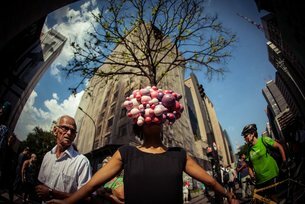 Having never visited or worked in Brazil before, this is an incredible opportunity for us to explore new cultural territory and develop our practice with the artistic exchange." Why we love them: MLF’s approach is collaborative and cross-disciplinary. They work alongside technologists, engineers and makers to create bespoke software and hardware systems to realise their creative vision. We think they’re really pushing the envelope on using technology in new ways to produce exceptional experiences for audiences and setting the benchmark for the UK’s creative technology sector.